In 3012, players start the game with small decks of Scout cards, which provide gold to make purchases. Two piles of cards – an Ally deck and a Weapon deck – provide static cards to buy, with three cards from each deck always available to purchase each round. Cards that are not bought remain there for other players to buy. Two non-static Action decks – one with cheap cards, the other expensive – are also available, and at the start of your turn, you reveal one card from each of these two Action decks. You get the benefits of the Action cards you reveal, whether you buy them or not, and they're removed from play if you don't buy them. 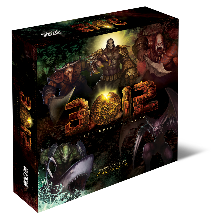 Unlike most deck-building games, there are many points of interaction in 3012, so players are never out of the action! And you always get to refill your hand to its maximum size at the start of your turn, so you are never penalized for interacting during other players' turns.